We had an meeting with one of our funding partners that specialises in helping finance recruitment agencies, and the conversation turned to the variety of full service recruitment outsourcing companies that are in the marketplace. These companies effectively take care of just about everything for a new recruitment agency. 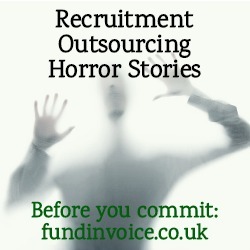 Full service outsourcing (sometimes called “white label” or “white labelling” services) sounds like a great idea, and there are some great providers out there, but very quickly a number of recruitment outsourcing horror stories emerged, about customers that found themselves trapped in such arrangements. I have to stress at this point that this problem does not apply to all providers, but it would be worth speaking to us about the alternatives, before you commit to a service. We asked the question of our funding partner, how do you sell your hybrid invoice finance and payroll management service against a full service recruitment outsourcing offering? On the face of it, the full service package sounds more attractive, especially if you are a recruiter that just wants to get on with selling placements, without all the other hassles of running a business. Our partner replied that such discussions often focus around how much control over their business the recruiter wanted to give up, and how much they want to pay to an agency. For example, they mentioned having to use the outsourcers own contracts, website design etc. They said they often ask the recruiter - do you want to give up that much control? Fixed percentage fees, that may have been acceptable for a startup, continuing to be applied as the business grew and became more established. Cases of customers complaining that the service is awful, with misallocation of cash and funds being withheld leading to the client being charged for overpayments due to unallocated cash that they were unable to access. The profit margin (which was paid by the outsourcer in question, to the client), being withheld as the client wanted to leave the outsourcing service. This potentially left the client in question with no income for several months. A company turning over several hundred thousand pounds a year, paying £1K per week in disbursements (charges for overpayments etc.). One customer commenting about his outsourcer "they make more money than me!". We had come across some examples ourselves, for example a small business which owed tens of thousands in fees to an outsourcer, being unable to leave the service until they paid the fees. The common theme seemed to be that customers need to check how easy it is going to be for them to leave the outsourcing service if they subsequently change their mind. Our funding partner, and others like them, offer hybrid services whereby invoice finance, with credit control and payroll management are provided to their clients, alleviating them from many of the headaches of running a recruitment agency. However, their clients still retain control of how they run their business e.g. which contract to use etc. Also, with invoice finance companies that are part of UK Finance, there is a standard set of rules which define how customers should be fairly treated, and how they should be handled if they want to leave the service. These are backed up by a robust complaints process supported by an Ombudsman service. If you are considering full service outsourcing, speak to Sean on 03330 113622 before you commit, to understand the alternatives that may be available to you. Article: Alternatives To Pay And Bill Recruitment Finance Services.